Just in case you waited till the last minute to make Easter Sunday dining plans, here’s a list of some of our favorite restaurants doing something special for Easter Brunch. (We didn’t include any that are only offering the regular brunch menu.) It’s not too late to secure a tasty spot to dine at this Sunday! Feel free to post in the comments if there is a place doing something great for Easter that we missed. Benjy’s, 2424 Dunstan: The Rice Village staple is offering a fixed price menu this Sunday for $38 per person. It includes three courses: first, main and dessert. Choices for the first course include the stuffed “churro” French toast and spring lamb tartine. For the entrées, Benjy’s is offering the pan-roasted catch of the day, Carnitas Egg Benedict and Vegetarian Cauliflower Cake. The two dessert choices are Mom’s Chocolate Cake and baklava. Reservations recommended. 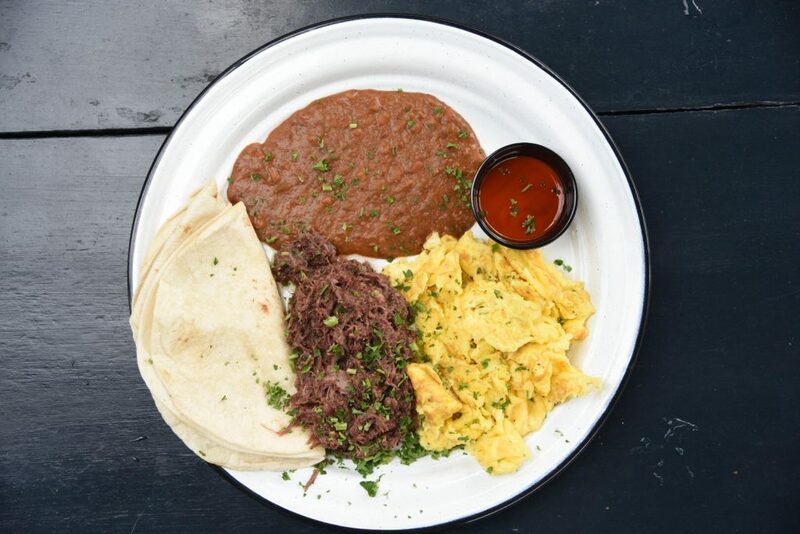 Brunch is served from 10 a.m. to 4 p.m.
Boheme’s New Oak Smoked Barbacoa Tacos. Photo Courtesy of Boheme. Boheme, 307 Fairview: More a bar and lounge than a restaurant, Boheme is spicing up Easter Sunday with both a drag show and a new brunch menu. New dishes include Oak-Smoked Barbacoa Tacos and Filipino Biscuits and Gravy with smoked longanisa sausage. New beverages include Torrontés (an Argentinian wine), the Aztec Wake Me Up coffee drink and Lazy Days made with red moscato, St. Germain, Aperol, lemon and ginger beer. Reservations are not needed, but if you want a good seat get there early. Brunch is served from 11 a.m. to 3 p.m.
Hugo’s spectacular buffet includes an array of housemade desserts. Photo courtesy of Hugo’s. The Chef Hugo Ortega “Triple Threat” — Backstreet Cafe, Hugo’s and Xochi: These three highly acclaimed restaurants are each offering up a creative take on Easter brunch. Backstreet Cafe, loved by diners for its big patio adorned in greenery and fountains, is offering a three-course prix fixe menuwith live jazz and an Easter egg hunt. It runs from 10 a.m. to 3 p.m. and costs $48 per person ($15 for kids 10 years of age and under). Menu highlights include beef carpaccio, bucatini with spicy crab and tagliatelle with fresh baby artichokes, peas, asparagus, herbed fresh goat cheese, pistachio pesto and a fried egg. Edited at 6:51 p.m. to reflect that Backstreet Cafe is currently on wait list only. Ortega’s namesake, Hugo’s, is offering an Easter Brunch Buffet with traditional Mexican dishes and a dessert station from 10 a.m. to 2:30 p.m. In addition to the buffet, which is $45 per person (and $15 for children), live music will be provided by Viento. Ortega’s newest Houston restaurant, Xochi, is offering an Oaxaca-inspired Sunday brunch buffet. Dishes range from traditional egg dishes to lunchtime items like seafood and grilled meats. Brunch at Xochi is also from 10 a.m. to 2:30 p.m. Reservations are highly recommended at all three restaurants. 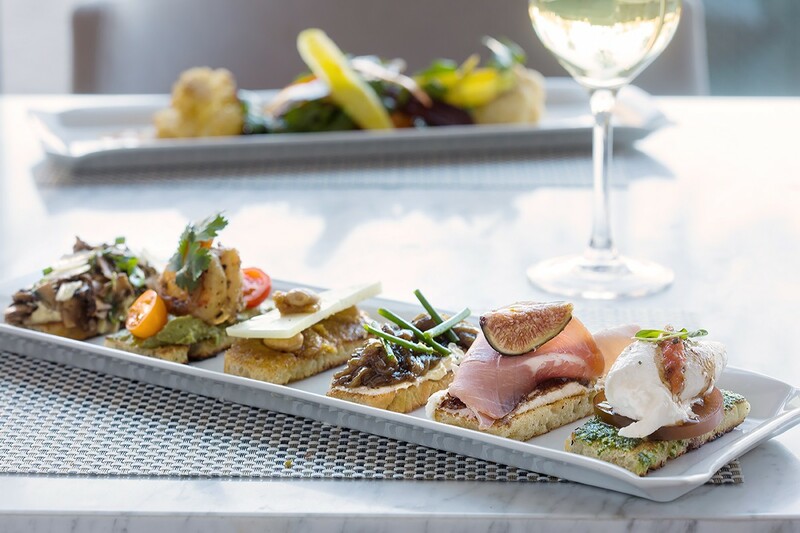 Fig & Olive’s signature crostini topped with a variety of Mediterranean ingredients, including burrata, pesto, tomato and balsamic; and manchego, fig and Marcona almonds. Photo by Shannon O’Hara. Fig & Olive, 5115 Westheimer: This is the recently opened Galleria spot’s first Easter brunch and it is offering a special holiday menu. It’s a $42 prix fixe brunch with options that include French toast stuffed with smoked bacon jam then topped with lavender Vermont maple syrup and bourbon vanilla whipped cream; Provençal Baked Eggs with Niçoise olives, ratatouille vegetables and a picholine dressing; and Moroccan Glazed Salmon accompanied by cauliflower couscous with raisins, fresh mint, parsley salad, fennel and preserved lemon purée. In addition to the special menu, some dishes from the regular menu will also be available, such as the crostini. It comes with a variety of toppings and is served as three for $13 or six for $22. Reservations are recommended. 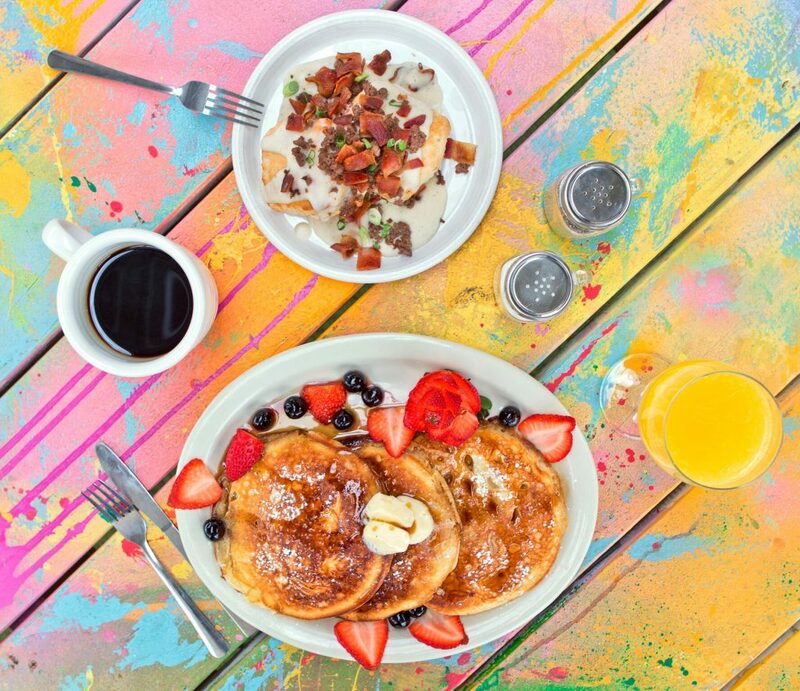 Brunch is served from 10 a.m. to 3:30 p.m.
Mixed Berry Pancakes, Biscuits and Gravy at FM Kitchen and Bar. Photo By Hannah Olson. FM Kitchen and Bar, 1112 Shepherd: While FM Kitchen and Bar gets a lot of buzz about the burgers, it also serves up a good brunch. This Sunday, in addition to their regular brunch menu, they are serving an Easter brunch menu with chef Ryan Hildebrand’s takes on classics like mixed berry pancakes, huevos rancheros, fruit parfait and biscuits with gravy. For those who just have to have one, the burgers are available for brunch, too. Reservations are not needed. Brunch service starts at 11 a.m.
Kings BierHaus, 2044 E. T.C. Jester: Dining at a beer garden for Easter Brunch might not be anyone’s first thought, but the inaugural Easter brunch at King’s BierHaus deserves consideration. It’s offering over 25 American classics and European favorites, all made from scratch. Reservations are limited and only recommended for parties of four or more. Brunch is served from 9 a.m. to 4 p.m., then it is closing early in honor of the holiday. Kiran’s dining room. Photo by Chuck Cook Photography. Kiran’s, 2925 Richmond: Chef Kiran Verma is serving a special Easter brunch this Sunday with two seatings to choose from at 11:30 a.m. and 2 p.m. The fixed price menu is $65 for adults, $25 for children under 12 and free for children five and under. Highlights include Malai Pancakes with pistachio crumbles from the starters and the buffet entrée section. It offers eight selection like Free Range Tandoori Chicken, Vindaloo Bison Meatballs and Shrimp with Green Mango Curry. The dessert display showcases six choices, including carrot cupcakes, Bird’s Nest with Spiced Truffles and Plum Parfait. Mimosas and Bloody Marys are also included. Reservations are required. 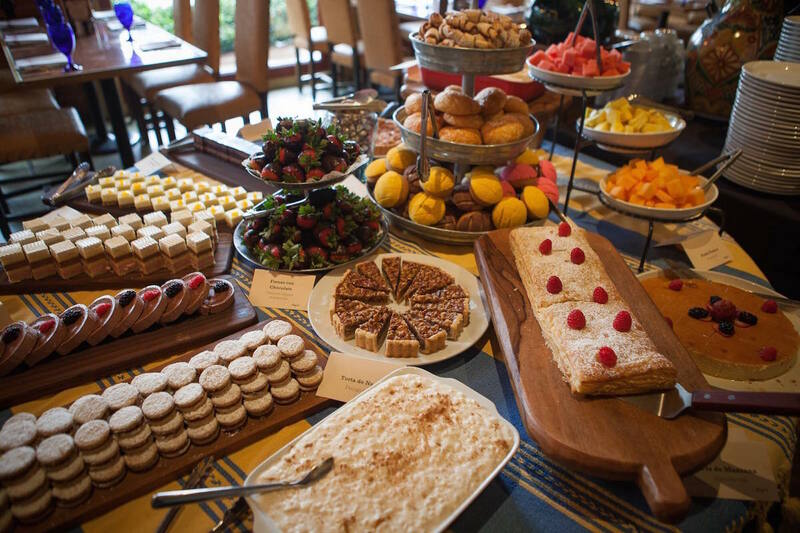 La Table, 1800 Post Oak Boulevard: Located on the upstairs level of La Table, Marché is offering a fixed price French-American Grand Brunch Buffet complete with the Easter Bunny this Sunday. Brunch is $59 for adults, $29 for children and includes a family-style served breakfast with pastry basket, scrambled eggs, seasonal fruit, buttermilk pancakes and “La Table” orange brioche french toast. Buffet stations include a raw bar, cheese and charcuterie selections, fresh salad, and a carving station of beef tenderloin, roasted chicken and seared Atlantic salmon, with a pastry corner of miniature confections for dessert. The Grand Brunch Buffet is served from 10 a.m. to 3 p.m. and reservations are recommended. 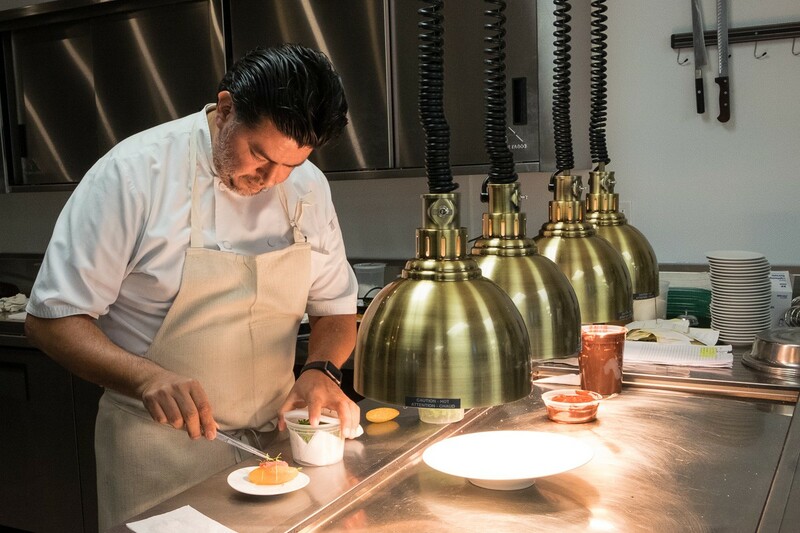 Chef Jose Hernandez prepares an amuse bouche in the kitchen of Lucienne at Hotel Alessandra. Photo by Phaedra Cook. 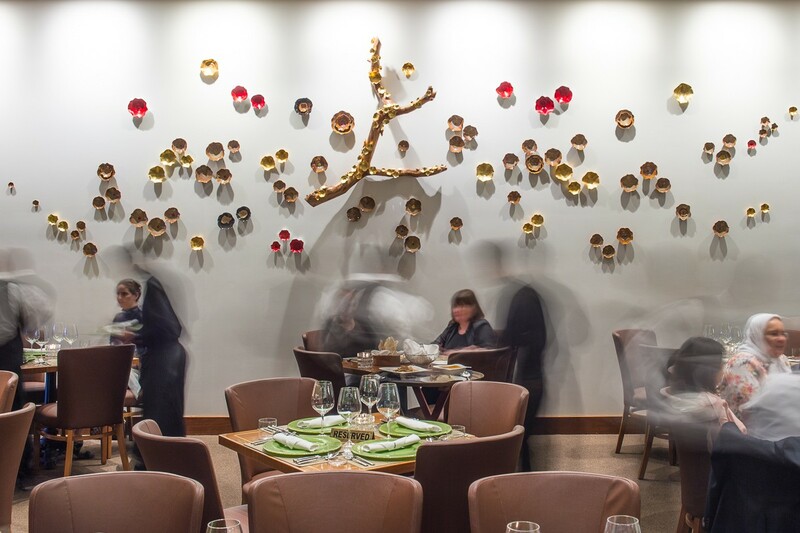 Lucienne, 1070 Dallas: Nestled on the second floor of Hotel Alessandra in downtown Houston, this upscale continental European and Mediterranean restaurant is as much a feast for the eyes as it is for the stomach. For the restaurant’s first Easter brunch executive Chef Jose Hernandez has created an exclusive three-course brunch menu featuring items like Duck Confit Pithivier (a pie enclosed in puff pastry) with morel sauce, mache salad and house truffle oil; Red Wine-Braised Short Ribs; Buttermilk Marinated Quail; and Passion Fruit Mousse. The special menu is $58 per person, plus tax and gratuity. A kids’ menu is also available and includes a Black Hills Ranch burger, spaghetti and peanut butter crepes. The children’s menu ranges from $12 to $24 per item. Reservations are recommended. Brunch is served from 11 a.m. to 3 p.m.
Maison Pucha. Photo by Phaedra Cook. Maison Pucha, 1001 Studewood: Chef Manuel Pucha’s new French eatery in the Heights is offering a family-style meal for its first Easter Brunch. The cost is $55 for those 13-and-up and $25 for children 12 and under. On the menu is traditional brunch fare like scrambled free-range eggs, potatoes and apple wood-smoked bacon and sausage, as well as a selection of pastries that include croissants, muffins and banana bread. For those with heartier appetites, there’s a carving station serving free range roasted chicken, Atlantic salmon and ribeye. For a sweet end to the holiday meal, there’s a chocolate fountain with fresh fruits, marshmallows and assorted mini pastries made by pastry chef Victor Hugo Pucha. Reservations are required. Brunch is served from 11 a.m. to 3 p.m.
with crème Fraiche and white balsamic caramel. Starting at 5 p.m., the regular dinner menu available as well as the $15 Sunday Supper (which changes weekly) and half-price wines. Reservations are highly recommended. Editor’s note: Rainbow Lodge is a valued Houston Food Finder sponsor. 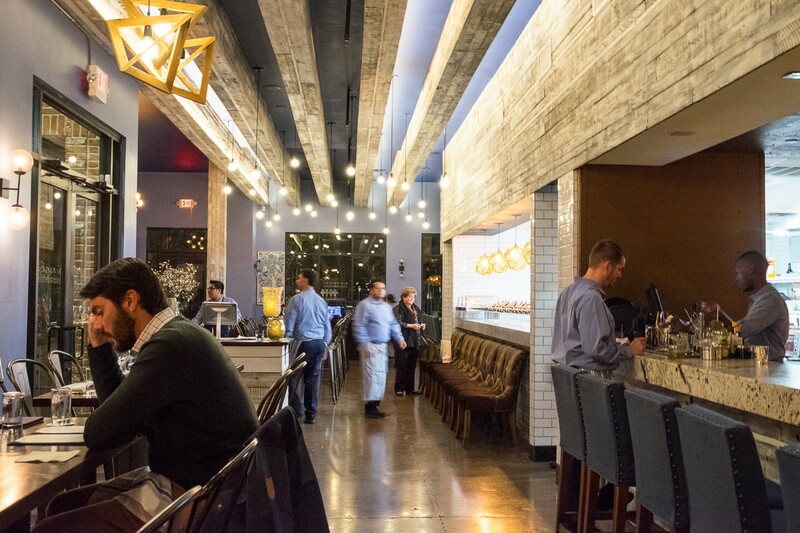 State of Grace, 3258 Westheimer: While State of Grace is serving its regular brunch menu during the day on a walk-in basis at the bar, diners might want to head in for Sunday Supper instead. For $29 per person, the four-course menu features some of the restaurant’s signature dishes like fried chicken, “old school” tacos and pecan bread pudding. Reservations are appreciated. Eat. Drink. Experience: Former MasterChef contestant and “chef about town” Alvin Schultz hosts these one-of-a-kind “experience dinners” out of his home in EaDo. He is hosting one this Sunday and there are only two spots left at the time of this article. The cost of $125 per person plus gratuity scores 13 courses (yes, come hungry) and an experience your taste buds won’t forget. Don’t worry, once you sign up you will get the address!